The lymphatic system returns fluids that have leaked from the blood (vascular system) back to the blood. Without it, our cardiovascular and immune systems would begin to shut down. The lymphatic system contains three parts, a network of lymphatic vessels, a fluid inside of the vessels called lymph, and lymph nodes that cleanse the lymph while it passes through. 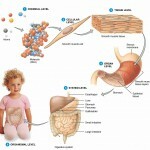 While blood circulates through the body, wastes, gases, and nutrients are exchanged between the blood and interstitial fluid. Different pressures (hydrostatic and colloid osmotic pressure) operating at capillary beds (at the very tip of where arteries and veins meet) cause most of the fluid to be reabsorbed at the vein end. The fluid that remains behind in the tissue spaces between the capillary beds (as much as 3 liters a day) becomes part of the interstitial fluid. This leaked fluid, along with plasma proteins that have escaped from the bloodstream, must be returned, to make sure the cardiovascular system continues to operate properly. 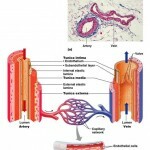 The problem of circulatory dynamics is resolved by lymphatic vessels, also known as lymphatics. Lymphatic vessels are drainage vessels that collect the excess interstitial fluid and return it to the bloodstream. 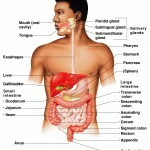 Once interstitial fluid enters the lymphatic vessels, it is called lymph. 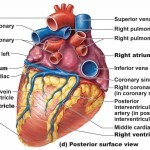 Lymphatic vessels form a one-way system in which lymph only flows toward the heart. Distibution and special features of lymphatic capillaries. (a) Structural relationship between a capillary bed of the blood vascular system and lymphatic capillaries. (b) Lymphatic capillaries are blind-ended tubes in which adjecent endothelial cells overlap each other, forming flaaplike minivalves. 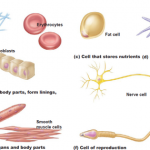 through tissue cells and blood capillaries in loose connective tissues of the body. Lymphatic capillaries are widespread, but they are absent from bones, teeth, bone marrow, and the central nervous system (where excess tissue fluid drains into cerebrospinal fluid). Although they are similar to blood capillaries, lymphatic capillaries are so permeable that scientists used to think they were open at one end like a straw. Now, scientists have discovered that they owe their unique permeability to two specific structural modifications. 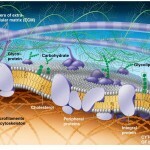 The endothelial cells that form the walls of lymphatic capillaries are not tightly joined. Instead, the cells edges overlap each other loosely, forming easy opening flaplike minivalves. Collagen filaments anchor the endothelial cells to surrounding structures so that any increase in interstitial fluid volume opens the minivalves, rather than causing the lymphatic capillaries to collapse. So, what we have is a system which is very similar to a bunch of one-way swinging doors. When fluid pressure in the interstitial space is greater than the pressure in the lymphatic capillaries, the minivalve flaps open, allowing fluid to enter the lymphatic capillary. However, when the pressure is greater inside the lymphatic capillary, it forces the endothelial minivalve flaps shut, preventing lymph from leaking back out as the pressure moves it through the vessel. Proteins in the interstitial space are unable to enter blood capillaries, (they’re too big) but they can enter lymphatic capillaries easily. In addition, when tissues become inflamed, lymphatic capillaries develop openings that permit the uptake of even larger particles such as cell debris, pathogens, and cancer cells. 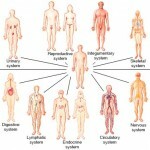 The pathogens can then use the lymphatics to travel throughout the body. This threat is partly neutralized because lymph travels through lymph nodes, where it’s cleansed and examined by cells of the immune system. A special set of lymphatic capillaries called lacteals transports absorbed fat from the small intestine to the blood stream. Lacteals are so-called because of the milky white lymph that drains through them. This fatty lymph, called chyle drains from the fingerlike villi of the intestinal mucosa. From the lymphatic capillaries lymph flows through larger and thicker-walled channels – first, collecting vessels, then trunks, and finally the largest vessels, the ducts. The collecting lymphatic vessels have the same three tunics as veins, but the collecting vessels have thinner walls and more internal valves. Generally lymphatic vessels in the skin travel along with superficial veins, while the deep lymphatic vessels travel with deep arteries. The largest collecting vessels unite to form lymphatic trunks, which drain fairly large areas of the body. The major trunks, which are named after the regions of the body they drain lymph from, are the paired lumbar, bronchomediastinal, subclavian, and jugular trunks, and the single intestinal trunk. Lymph is eventually delivered to one of the two large ducts in the thoracic region. The right lymphatic duct drains lymph from the right upper limb and the right side of the head and thorax. The thoracic duct (which is much larger) receives lymph from the rest of the body. It arises as enlarged sac called the cisterna chyli, that collects lymph from the two large lumbar trunks that drain the lower limbs and from the intestinal trunk that drains the digestive organs. As the thoracic duct runs superiorly, it receives lymphatic drainage from the left side of the thorax, left upper limb, and the left side of the head. Each terminal duct empties its lymph into the venous circulation at the junction of the internal jugular vein and subclavian vein in its own side of the body. Like the larger blood vessels, the larger lymphatics receive their nutrient blood supply from a branching vasa vasorum. When lymphatic vessels are severely inflamed, the related vessels of the vasa vasorum become congested with blood. As a result, the pathway of the associated superficial lymphatics becomes visible through the skin as red lines that are tender to the touch. This unpleasant condition is called lymphangitis. 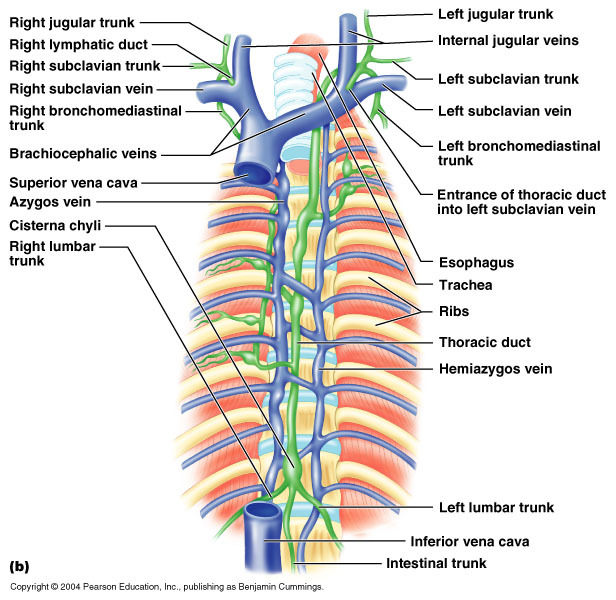 Major lymphatic ducts and trunks in relation to veins (anterior view of the thoracic and abdomnial wall). The lymphatic system lacks a pump. Under normal conditions, lymphatic vessels are low-pressure conduits and the same mechanism that promotes venous return in blood vessels acts here as well (the milking action of skeletal muscles, pressure changes in the thorax during breathing, and valves to prevent backflow). 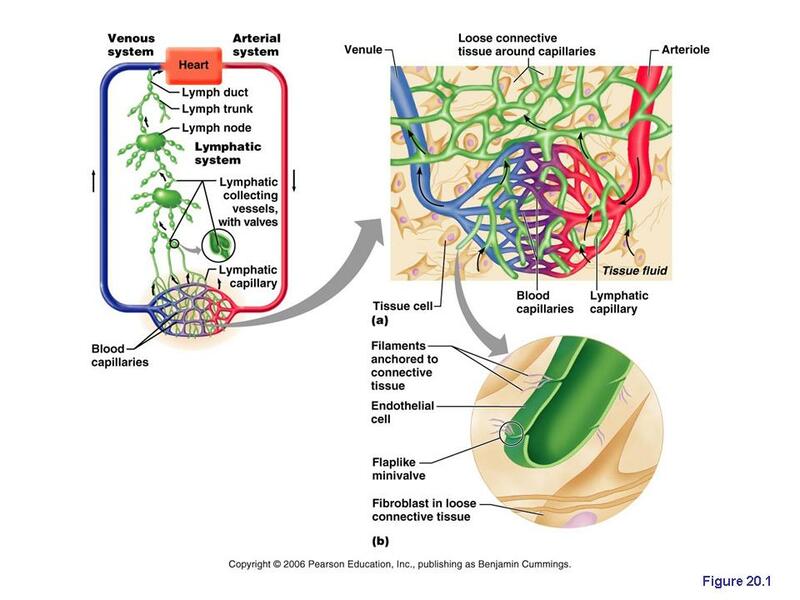 Lymphatic vessels are usually bundled together in connective tissue sheaths, along with blood vessels, and pulsations in nearby arteries also promote lymph flow. In addition to these mechanisms, smooth muscles in the walls of lymphatic vessels contract rhythmically, helping to pump the lymph along. 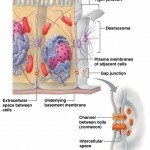 Even with aid from the above, lymph transport is still slow and sporadic. Movement of adjacent tissues is very important in propelling lymph through the lymphatic vessels. When physical activity and movement increase, lymph flows more rapidly. Because of this, it’s a good idea to immobilize a badly infected body part to hinder flow of inflammatory material from that region. Anything that prevents the normal return of lymph to the blood (tumors, etc.) results in short-term but severe localized edema (lymphadema). However, usually the vessels in the area begin to grow and drainage is reestablished. Why do we want to prevent the flow of inflammatory material from an infected region? Wouldn’t increased lymph flow facilitate lessening of swelling since dead cells and the waste from white blood cells (inflammatory material, correct?) causing the swelling would be carried away faster? 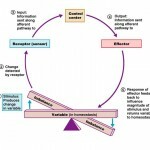 If you could elaborate a bit more on this subject it would help me a lot to clear up my confusion. Thank you. No problem, the main concern in this type of situation is sepsis. You never want a bad infection to spread because it can overwhelm the blood and cause sepsis which is a potentially life threatening blood infection. Your idea of speeding up the process by increasing lymph flow is logical, but in this case very dangerous. You can’t stop or cleanse an infection by spreading it through circulation. 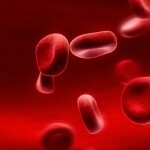 Sepsis is a serious issue in healthcare, always immobilize badly infected areas. I hope this helps! Thanks for the question/comment.